You’ve gone to great lengths to plant and nurture your organic garden. You’ve nourished the soil properly, planted in the proper location, used organic mulch to control weeds and you’re patiently awaiting that first luscious tomato or tasty pepper to appear. Instead, what you see is some annoying little bug eating away at your vegetables before you’ve even had a chance to taste it yourself! It might seem unlikely that you can keep bugs at bay without spraying them with something to facilitate their immediate demise, but it is possible. First, assess the situation. Are the bugs devouring your entire plant or are they just having a small sample? Healthy plants can stand up to minor chewing. Take a look at your plants. In nature, the strong prey on the weak. If your plant is weak and sickly, they won’t be able to withstand the attack. You may have to sacrifice it in favor of your stronger, healthier plants, or nurse the sickly plant to a stronger, healthier condition to survive. An ounce of prevention….you know the saying. There are a lot of things you can do to help prevent attacks from insects. First, only grow plants that are meant to thrive in your area and garden site. A plant that needs 6 hours of sunlight will not thrive in 2 hours of sunlight and will become weak and vulnerable. Keep your soil healthy and don’t let things get too wet, nor too dry. When it’s time to take stronger measures, you can use products that are made for the organic gardener. Sprays and powders are available at garden stores that are not made from chemicals, but rather made from plants. They are safe to use, just make sure to read the instructions and use them accordingly. Another alternative is to enlist the help of other bugs and animals. Many species of birds and insects are a huge help in controlling unwanted pests in the garden. To attract the right birds, place feeders or bird baths in the garden. Ladybugs are delightful little creatures that feast on aphids. They can eat as many as 50 a day! If you don’t notice ladybugs in your garden area, you can buy them and let them set up housekeeping. Other bugs like praying mantis and animals like frogs and help control pests in your garden as well. 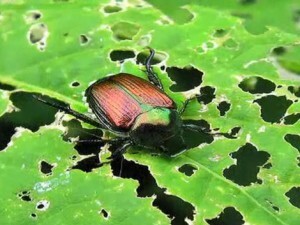 It is possible to control pests in the organic garden, it just takes a little time and attention!